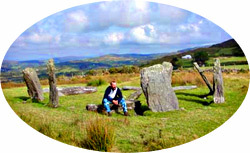 Megalithomania.com is a site originally dedicated to Irish megaliths, but now expanded to include all sorts of antiquities that are of importance/interest. It now covers historic and prehistoric sites across Ireland, including Neolithic, Bronze Age, Early Christian and Medieval monuments. My third book about Ireland's prehistoric heritage, Monu-Mental About Prehistoric Antrim, is now available and, like my first two books, Monu-Mental About Prehistoric Dublin and Monu-Mental About Prehistoric Waterford, is available in the shops or from this website - just click Shop at the top of the page. I try and visit sites as often as I can, trying to get out twice a month, but failing lately due to work pressures. For quick access to the latest trips use the link on the menu bar. To browse all the sites I've visited over the last 9 years use the links on the left-hand side. The descriptions that you will find here are my own, they are not always as objective as they probably should be, but that is because visiting stones, for me, is a very subjective experience. My interest goes well beyond the physical site itself, or what others consider as being 'the site'. I believe that a site extends beyond the local limits and into the landscape that surrounds it. I am constantly marvelling at locations and often comment more on the landscape than I do on the monument itself. You will find some archaeological information here, but I try to offer more than facts and figures: I offer perspective in time and place. Reports of my earlier visits differ greatly from later ones. This happens as you travel around. Each new site adds to your knowledge and feelings about the next. A new site may make you realise that something you saw at another location is important after all. With many of the early sites I do need to go back and use the things I've learned from later visits to assess them. Time. It's all about time and finding enough of it. I hope you get as much pleasure from these pages as I have had visiting the sites herein and, furthermore, I hope that it encourages you to go out and visit some of them too. Until we meet in the stones ... Ride On!! There's a wonderful feeling I used to experience and for far too long took or granted. That feeling is the one of parking the car, walking to the back, putting on a pair of walking boots and getting excited about seeing something new! It's such a simple thing, but it's wonderful. I had the chance to spend a few wet days in Armagh and decided I would try to take it easy, but visit some places again, and see some new monuments. When staying in Armagh you can't avoid going to Navan Fort and the King's Stables, even if you've been there before, so these were the main targets of the first day. The weather meant I had to do them in a weird order, starting at the King's Stables, visiting a couple of other sites and then coming back to Navan Fort. I also had a look round Armagh Museum, too. It's small, but does have some nice items on show. Apart from the Mesolithic and Neolithic artefacts, there is one of the skulls found in the King's Stables. The a lot of the displays are natural history and some very fine costumes. It's worth a visit if you have an hour or so.